"Millions of years of planet wide civil war and NO ONE killed that guy?" Chromia is a master of infiltration, sabotage, and kind of tactical counterstrikes that crush an opponent's morale. Unlazed by any enemy or situation, she can always be counted on to step up when her team's in a tight spot. Well, I know nothing about Chromia pre-IDW, so I'm going to talk about IDW Chromia. Chromia, like Windblade isn't a Cybertronian but a Camien. She is Windblade's bodyguard, trainer and best friend. I really enjoy reading her relationship with Windblade, they are pretty close, almost like sisters and like close friends, they joke, they tease each other and look after each other. Hurt Windblade and you'll have to answer to Chromia and her giant axe. It's safe to say that I really like her, and again you'll never learn all that from the comic that included with this figure. 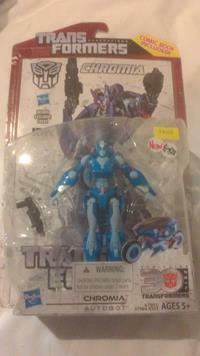 Chromia is a retool of Transformer Prime Robot in Disguise Arcee, so naturally like Arcee, she is a bike, a Cybertronian bike.. Oops, sorry I mean a Camien bike. Her ALT mode is pretty futuristic and pretty good looking and most importantly of all, she looks nothing like PRid Arcee. 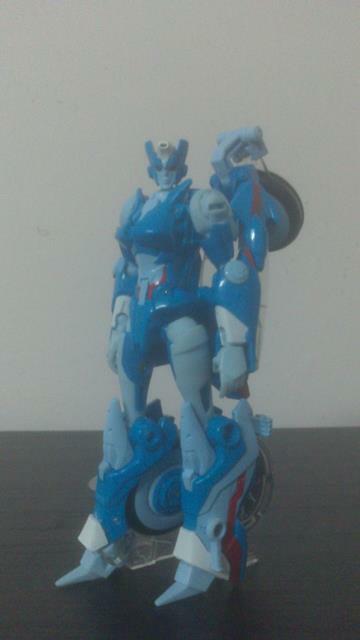 In bike mode, she is primary light blue with a lighter blue highlight, some red here and there and very little white. Overall, she got a pretty good paint job. She also got a lot of new parts. She got a new bike seat, new windshield, along with new headlights, a new tail design that does a pretty good job of hiding her hands and a pair of new wheels that not only roll well, but also allow the bike to stand up without using the kick stand, provided you get the balancing just right. The only problem it have is that the front of the bike won't properly peg into her legs, a similar problem with Transformer Beast Hunter Arcee, but unlike BH Arcee, it doesn't pose any problem, pegged in or not, doesn't really matter. Overall, Hasbro did a pretty good job in Chromia's bike mode even though its not 100% accurate to the comic, it doesn't have any problem or design flaw that would hinder the vehicle mode. Transforming to Robot mode is very similar to PRiD Arcee, so it's pretty simple and easy to learn. Because of the new part, it has 2 extra step which is, 1. You have to unpeg the windshield to unlock the front of the bike and 2. Flip up the tail of the bike to unlock the arms. In robot mode, she has the same color pattern as the bike mode and like her bike mode she got some new parts but unlike her bike mode, those new parts will give a huge enough differ look to separate her from PRiD Arcee, but it also causes some problem to her robot mode. Her head is very accurate to the comic and G1 and very nicely painted, but her eyes, while having light piping because of their poor choice in color (smoke), it doesn't work well. If only they choose blue like PRiD Arcee and BH Arcee, she would have a great pair of eyes. She got a new pair of arms, well it can be considered new because everything except the shoulder and hand is new, new bicep, new elbow and new forearm. She also got almost a new pair of legs, I say almost is because generally the legs are the same as PRid Arcee, its the same shape and design, the only thing differ is they just add and change some details to the legs. For articulation, her head is on a ball joint, so her head can look everywhere, but up. Her arms can swing back and fore for a full rotation of 360 degrees, can move outward, no rotation at the bicep, elbow bends at 90 degrees and a full rotation, a full rotation at the wrist and bend forward 90 degrees. Nothing at the hip. Her legs can swing forward 90 degrees, depend on how much you flip up the back skirt, it can swing backward for as much as 90 degrees, almost a full rotation at the thigh, knee bend almost a 90 degrees and nothing at the foot. So overall, she is pretty good looking and pretty articulated, but she is not perfect, a lot of the problem come from the new parts that she has. Her new arm while offer a new look, it also looks slightly disproportionate as its pretty bulky. Her back-skirt will bang to the legs and while limited some articulation of the legs, it also can be flipped up, all the way, if you don't mind adding more bulk to her already huge backpack. As I mention before, she got a new headlight along with a new windshield and this new windshield become a huge backpack for her, however its not noticeable from the front, but from the side, yeah, she look pretty wide from the side.. If you think PRid Arcee's backpack is huge, you will not like Chromia's backpack. As for weapon, well this is a bit disappointed as she only comes with a small handgun. Well, OK, it's not a huge problem as many transformer comes only with one weapon, but I was hoping they would give her a battle axe like the one she uses in the comic, after all, Camien are suppose to be great at melee weapon. 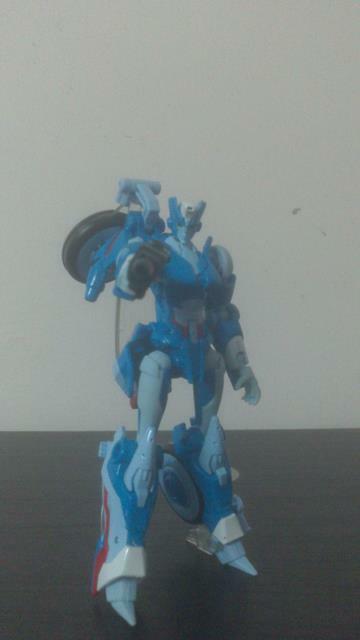 OK, she comes with a handgun that can be held by her or pegged to her legs in both robot and bike mode. Overall, Chromia's robot mode is pretty good, its nice looking, it's articulated and the only major problem is the backpack. Durability: 8, nothing fall apart, but might want to watch out when rotating the elbow as its pretty tight. Fun: 7, her vehicle mode is as fun as your average model car. Her robot mode has more replay value. 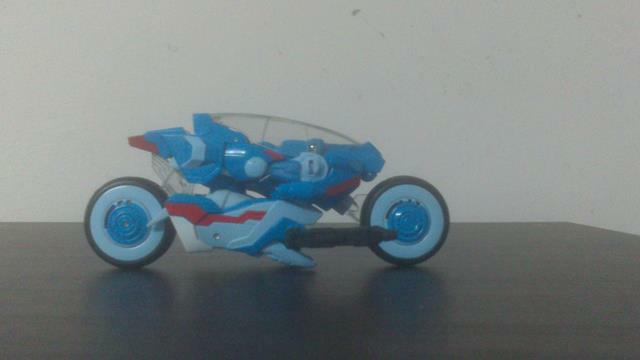 Aesthetics: 8, pretty accurate to the comic in both robot and bike mode. Articulation: 7, limited spread angle on her arm and legs, but still pretty flexible. Value/Price: 6, well, as I post this review, Generation line is being replaced by newer Robot in Disguise and Combiner Wars line, so she will be harder to find in the store, her price will go up soon, so grab her while you can. 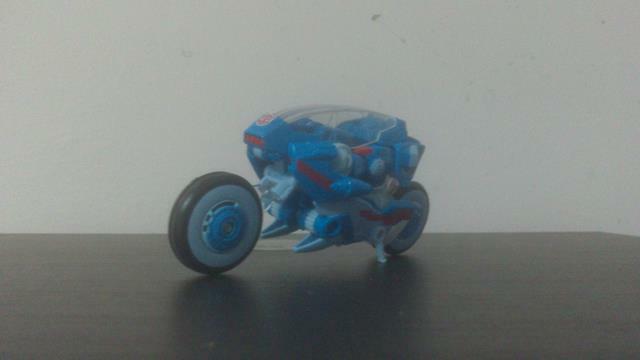 Overall: 8, Chromia is a pretty good figure overall, nice looking bike mode, nice looking robot mode with some problem. I highly recommended her, especially if you already have Windblade in your collection.